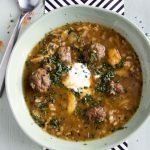 This hearty meatball soup is thickened with brown rice and flavored with sweet tangy apricots, shallots, and fragrant herbs. The topping of creamy yogurt and freshly chopped herbs takes it from delicious to divine! This meatball soup is like a delicious journey to a far away land. The broth is flavored with melted apricots, shallots, thyme and mint. The broth is sweet and rich. The abundance of meatballs and rice make this soup as satisfying as stew. The toppings of creamy yogurt and fresh herbs add a spectacular (not to be missed!) finishing touch. I decided to try the exotic-sounding ‘Dried Apricot Soup with Wheat Berries.’ I made a few changes. I added meatballs, lots of tiny meatballs. I love meatball soup – especially when there’s a chill in the air. Also, I used brown rice instead of wheat berries, because brown rice is a staple in my pantry; it adds great texture to soup; and it’s gluten free. You can absolutely use wheat berries or farro, if you prefer either of those grains to brown rice. For the meatballs I kept it really simple: a pound of ground beef mixed with grated onion and salt, rolled into tiny meatballs, and sautéd for a few minutes. Sauté shallots. Add rice, broth and dried apricots. Simmer for 30 minutes. While the broth simmers, mix, roll, and sauté the tiny meatballs, and dice the potatoes. 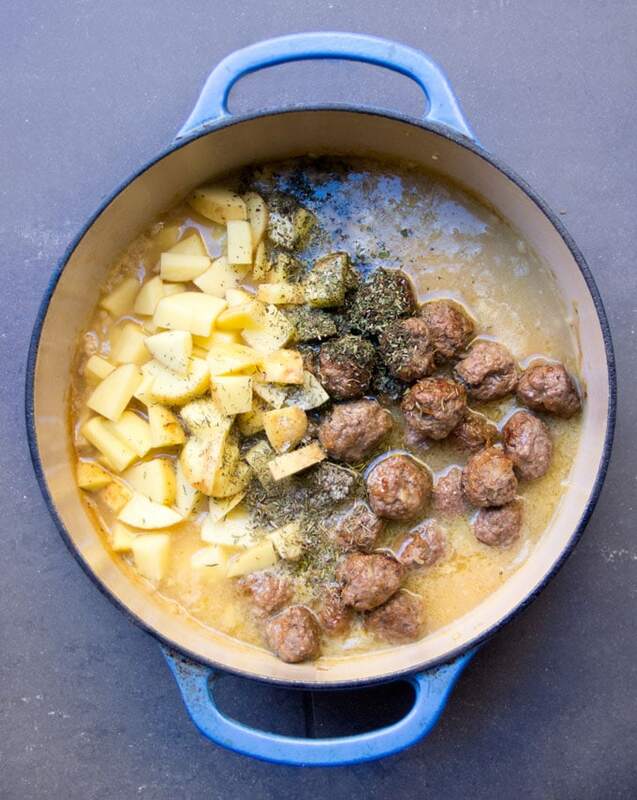 Once the soup has simmered for 30 minutes, add the meatballs, potatoes, and dried herbs. Cook for for 15-20 minutes longer, until the potatoes are tender and all the flavors are melded. Ladle the soup into individual bowls and top with a generous dollop of thick yogurt and a healthy sprinkling of fresh herbs. The toppings add wildly exciting flavors that harmonize beautifully with the comforting rich broth and hearty meatballs. 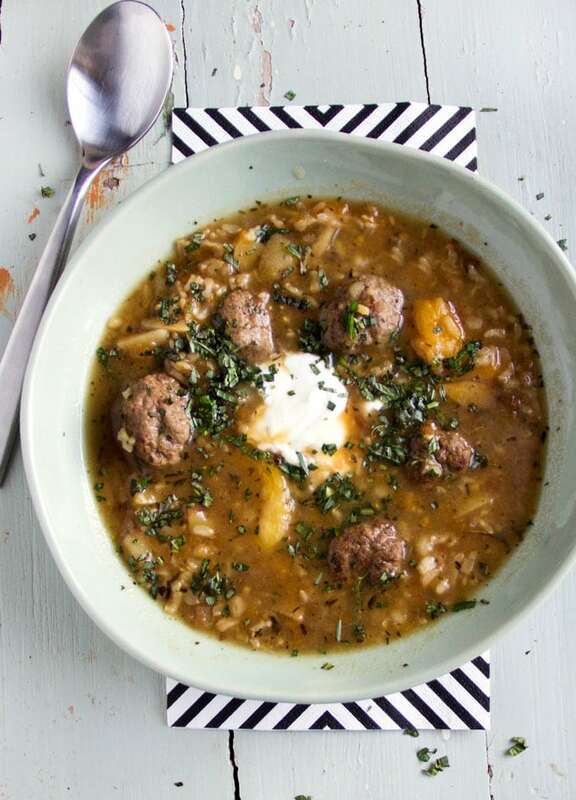 This Persian meatball soup is substantial enough for dinner. A green salad with a vinegar or lemon dressing is a great accompaniment. I served it with a simple salad of arugula, red onion and marinated beets (from the salad bar at Whole Foods), drizzled with olive oil and balsamic vinegar – delicious! Meatball fans might also like to try this incredible Turkey Zucchini Meatball Recipe from Yotam Ottolenghi or this recipe for Turkey Falafel Meatballs with Lemon Yogurt Sauce. Here’s the recipe for Persian Meatball Soup. If you make this, I’d love to hear what you think. I hope you’ll come back to leave a review and let me know how it turned out. 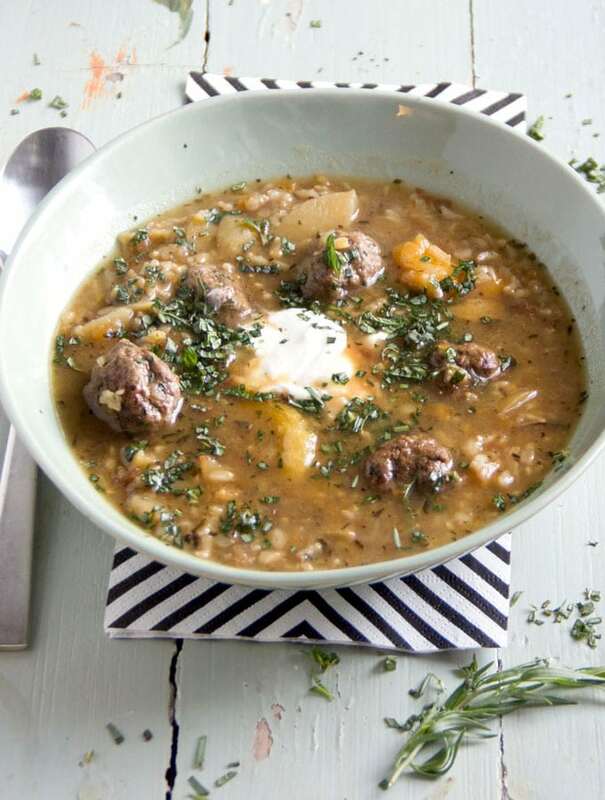 A warming hearty soup with rice and meatballs and vibrant flavors of apricots and fresh herbs. Start The Soup: Heat 2 tablespoons oil in a large heavy pot over medium heat. Sauté the shallots for 3-4 minutes, until they soften. Add the rice toss it around in the pot until all the grains are coated with oil. Add the apricots and 5 cups of chicken broth. Bring the soup to a boil. Reduce the heat to low. Cook at a strong simmer for 30 minutes. 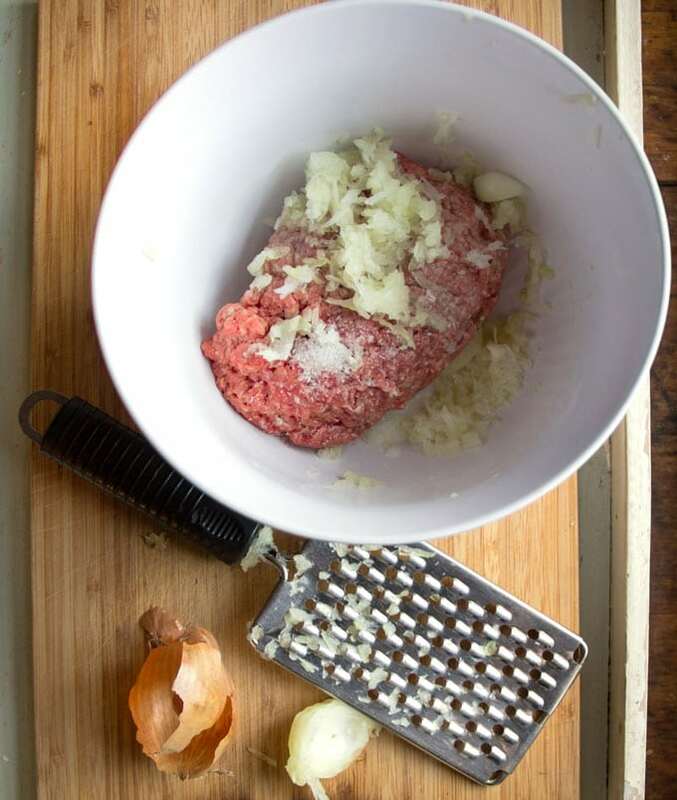 Shape and cook the meatballs: While the soup is simmering mix the ground beef with the onion and 1 teaspoon salt. Roll into small (1-inch) balls. 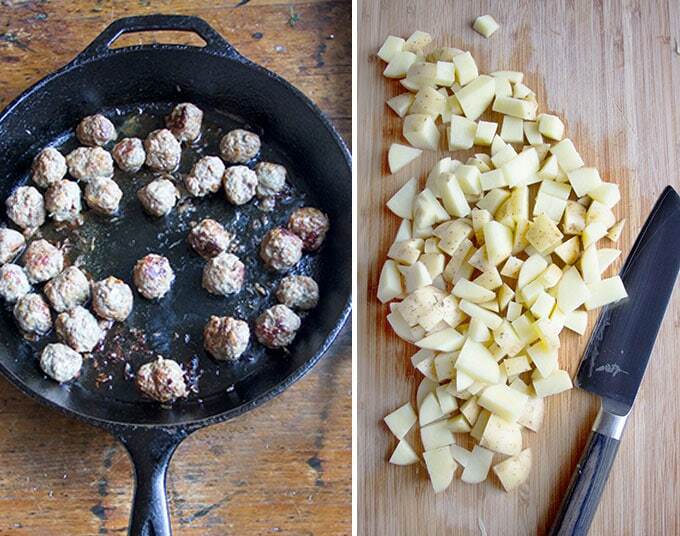 (30-32 meatballs) Spread a tablespoon of olive oil over the bottom of a large skillet. Add the meatballs to the skillet and turn the heat to medium-high. Brown the meatballs on all sides, 4-5 minutes total. Remove from heat. Finish The Soup: Once the soup has simmered for 30 minutes, add the meatballs, potatoes, remaining 3 cups of broth, dried thyme, dried mint, and 1 teaspoon of salt. Turn the heat to high to bring the pot to a boil. Reduce to low heat and simmer for 15 minutes longer, or until the rice is tender. Remove from heat. Cover the pot and let it sit for 5-10 minutes. Season with salt and pepper, to taste. To Serve: Ladle soup into individual bowls. Top each bowl with a heaping tablespoon of yogurt and a heaping teaspoon of each of fresh herbs. Loved it and it was super easy to make. I did find my guest and I all agreed that we needed a bit more spice. So next time I will make it with a bit more zig. Been on my to-try list since you posted it, Lisa, and finally got to make it. Another winner! I used brown basmati for this soup (our go-to rice), which takes a bit longer to cook. Added about ten minutes to the total cook time, but it worked out just fine. Normally, with brown basmati, I “fry” it until it turns opaque and even starts to pop, then add the liquid. Next time I’ll use that procedure, which should put the cook time right on target. I might vary it, too, by using Turkish prunes next time, just to add that slightly sour note. Hey Brook, I’m so glad to hear that you enjoyed the soup. Thank you for your note. And I really like your idea of Turkish prunes in the mix. This looks interesting ! Definitely on my to do list ! Thank you and have a pleasant day !